The first time you use the RescueRake™, set up your workspace where you and your pet will be most comfortable and you will have the best lighting. Bring your reading glasses or a magnifying glass and your “good scissors” just in case you need to cut out a mat. RELAX. 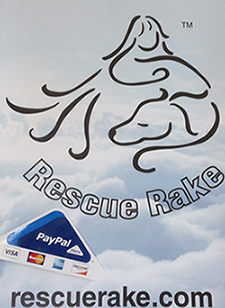 Toss out any feelings of guilt you have about the tangled condition of your pet’s coat, you are taking care of that now with the RescueRake™. The reason we don’t believe in using the tools with blades is that it’s too easy to harm your pet’s skin or yourself. It’s very easy to use those tools too fast or with too much pressure and before you know it you have sliced off something that belongs there! We suggest you cut out a thick or tight mat by placing your fingers between the mat and the skin and then cutting the mat on the other side of your fingers… leaving a short stub of the mat. Then you can “tease” the mat apart with your fingers until it’s loose enough to release the skin or debris until the RescueRake™ will glide through it. The first time you do this it IS very tedious because you don’t know what’s under the thick, tight, mats. Most likely it is debris or dead coat, but it could be insects or old wounds, or lumps that grow on the skin that are nothing to worry about or need to be shown to your vet. Whatever is under there, you don’t want to rip through that tight mat with one of those tools with blades because you might be slicing open the skin. Be sure to end the session before you or your pet gets too tired. Don’t worry, the tangles and mats will wait for you until tomorrow! Reward your pet and yourself for taking the first step to a healthy coat and body. Once all the thick and tight mats and tangles are gone, your RescueRake™ will be your daily coat maintenance tool and it will just take a couple minutes to go through the coat and make note of any new lumps or bumps that weren’t there the last time you looked.